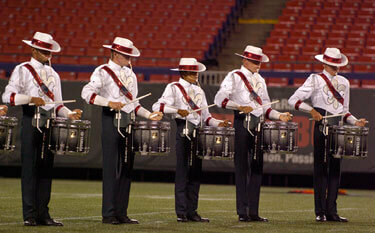 The Madison Scouts are pleased to announce the corps' full percussion staff for the 2007 season. "As we assembled our percussion teaching staff, our goal was to find the most dynamic, creative and experienced teachers we could who also believe in the Madison Scouts," said Executive Director Jeff Spanos. "I'm excited to see the blend of influences and backgrounds we have assembled with our new percussion staff and how we'll evolve the look and sound of the Madison Scouts' percussion program." View a list of percussion staff members on www.madisonscouts.org.